After PSG’s demolition of Barcelona on Tuesday, the expectations were pretty high for Wednesday’s Champions League fixtures. The headlining match had to be Arsenal’s trip to the Allianz Arena to take on a seemingly unstoppable Bayern Munich side. With Arsenal’s struggles in the Premier League, I’m not sure how many of their fans would’ve been expecting a win from this tie. Could the London club mirror PSG and pull off an upset of their own? Well, it didn’t start too well for the Gunners, with Bayern finding the back of the net before 15 minutes had even ticked off the clock. Arjen Robben got the ball on the right wing before cutting inside and curling a picture-perfect shot into the top corner past David Ospina. It looked like it was going to be business as usual for the Bavarian giants as they took the early lead. Despite the early setback, the Gunners didn’t self-destruct. Arsenal were going toe-to-toe with Bayern, and their hard work paid off just before the half hour mark. Laurent Koscielny did well to tap the ball away from Robert Lewandowski, who was trying to clear from a corner kick. The Polish striker’s swinging foot was enough to knock Koscielny down and gift Arsenal a penalty kick. Alexis Sanchez was the man selected to take the spot kick, and his initial drive was expertly saved by Manuel Neuer. Sanchez was the quickest to reach to the rebound, but his second shot was a mishit. Miraculously, Bayern’s defense was still late to respond and Sanchez got a third shooting chance which he blasted into the back of the net to level the scores. 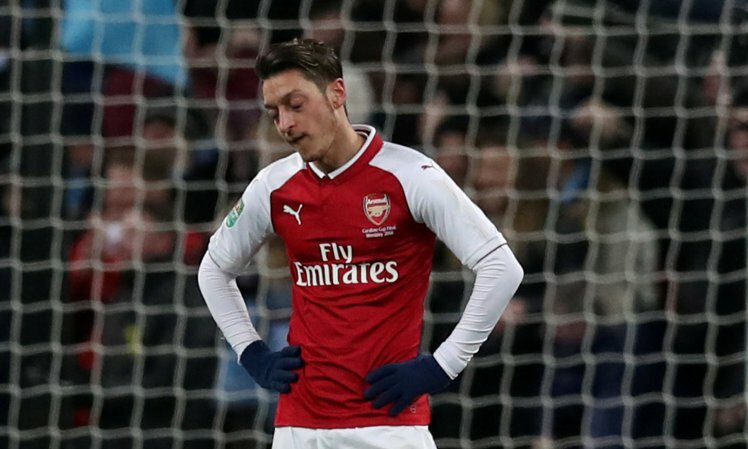 The unorthodox goal from the Chilean gave the Gunners a vital away goal at the Allianz Arena, and you couldn’t blame Arsenal fans for being optimistic about their future in the competition. Sadly, any optimism that they would’ve had going into the break was quickly dispelled after the restart. Two minutes into the second half, things started to fall apart for Arsenal. Koscielny, who had been one of Arsenal’s best performers on the day, was forced off through injury. After his departure, the Gunners’ backline appeared to completely fall apart. In the 53rd minute, Phillip Lahm, who is retiring at the end of the season, sent in a lofted cross from the right flank. Lewandowski made an early jump to get over Shkodran Mustafi and nod the ball past Ospina. 2-1 Bayern. Three minutes after Lewandowski’s goal, the former Borussia Dortmund striker set up Thiago with a beautiful backheel flick into the penalty area. Thiago was never going to miss that chance as he easily slid the ball inside the far post to give the hosts a two-goal advantage. As if that wasn’t bad enough, in the 63rd minute, Thiago grabbed a second goal. Arsenal struggled to clear the ball from a corner kick, and the Spanish midfielder hit a powerful shot into the traffic in front of the net. Luckily, for him, Granit Xhaka provided enough of a deflection to send the ball past Ospina to give Bayern a commanding 4-1 lead. The cherry on the icing on the cake, for Bayern fans, came in the 88th minute. A horrendous giveaway from Alex Oxlade-Chamberlain outside of his own penalty area sparked the chance, and Thomas Muller was there in the end to finish it off. A final score of 5-1 all but eliminates Arsenal from European competition, but no team can really be embarrassed after losing to Bayern. After this dominant performance, Bayern have to seriously be considered as the favorite to win it all this year. They showed the world what they are capable of when everything is clicking, and it’s hard to think of a team, especially with Barcelona’s chances looking increasingly slim, that can handle them.